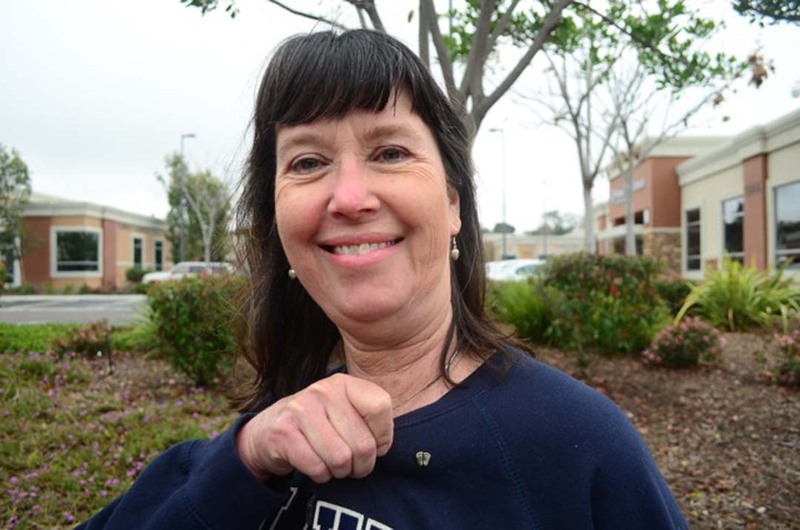 VISTA — Maggie Devlin showed off a small pin on her sweatshirt. The pin wasn’t probably more than half-an-inch in size and was in the shape of two small feet. She said it represented the size of a baby’s feet in the fetus at 6 weeks old. Devlin was one of the pro-life protestors standing out front of the Vista Planned Parenthood on Via Centre last weekend, taking part in a local Protest Planned Parenthood rally that was also happening nationwide. She was one of about 45 pro-life supporters to take part in the local rally. The nationwide rallys come as the Republican-majority held Congress continues to make moves towards defunding Planned Parenthood, the nonprofit healthcare provider that offers several health services, including abortions. Joanne Strantz, another of the pro-life supporters at Saturday’s rally, said what they were out there doing was a “prayerful protest,” not a political one. The demonstrations are peaceful, she said, adding that they were out there to support women. 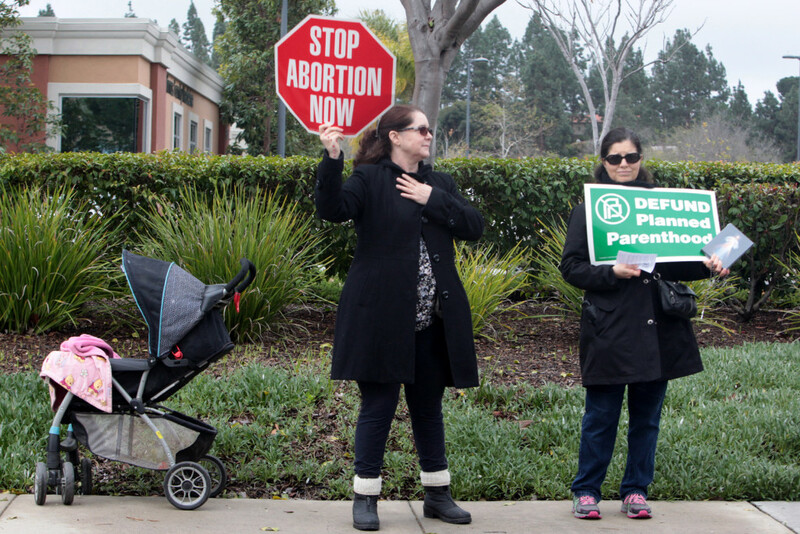 While not an official group, Richard Hodges and a number of other North County pro-life supporters stand outside the Vista Planned Parenthood every Monday and Thursday each week. Hodges said he didn’t think there would be any negative ramifications should the healthcare clinic be forced to close its doors if it lost its federal funding. “Not at all,” said Hodges. “I just think it’s really sad that, as human beings, we don’t respect life at all. Our society now, whether it’s the unborn or whether it’s the elderly, we just don’t have a respect for life. If we don’t respect life at the very beginning — the very foundation — drugs, alcoholism, divorce and all that, it’s a joke. “If society would be more concerned with the human race instead of material things, we can only be more healthier,” he said. Standing just a few feet down the sidewalk, Alexis Panchevre and a handful of other pro-choice supporters held a pro-Planned Parenthood rally of their own. 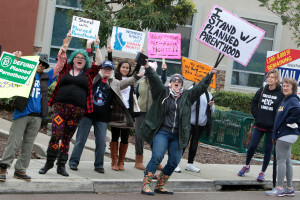 Panchevre said she wanted to march in solidarity with the healthcare provider, even as a larger Defend Planned Parenthood rally was taking place at the same time in Encinitas. Showing support was important to her, she said, as there were so many issues at stake, going beyond women’s issues and including the separation of church and state. Panchevre planned to make a donation to the clinic after making her message heard, and feared what could come if it lost its funding. “I would definitely say that we would see an uptick in teen pregnancy again. I think that we would see an uptick in STDs,” Panchevre said. She said most people don’t even realize how many aspects of life the healthcare provider touches with its services. Cita Walsh, vice president, marketing and communications of Planned Parenthood of the Pacific Southwest, said the Vista health center saw 16,549 patients during the last fiscal year. According to Walsh, approximately 8 percent of these patients use commercial insurance, 60 percent use Family PACT, 22 percent Medi-Cal, and 10 percent use cash.